Do you use a location-based app or service like Foursquare or Gowalla? Then you are a member of a tiny minority of Internet users, according to a new report from the Pew Research Center’s Internet and American Life Project. The survey found that only 4 percent of online adults use any service that allows them to share their location with friends, and on any given day, just 1 percent of Internet users are making use of such services. The multimillion-dollar question is whether the launch of Facebook Places, and particularly its recent mobile Deals feature, will change those numbers and make location services go mainstream. The study’s overall conclusions are not a surprise: a Forrester research report in July came up with similar numbers. It also found that only 4 percent of U.S. online users had ever used a location-based application, and almost 85 percent of those surveyed by the research company said they were not familiar with location-based apps at all. 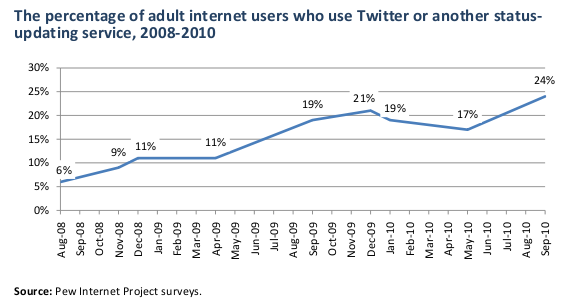 As the Pew report points out, it wasn’t that long ago that Twitter reached a similarly tiny proportion of Internet users, and it has effectively achieved mainstream status, with almost 25 percent of survey respondents saying they use it. One thing that could help catapult location-based services into the mainstream is the arrival of Facebook Places. The new feature is only a few months old, but according to a statement by CEO Mark Zuckerberg on Wednesday, it already is “multiples bigger” than any other location service. By way of comparison, Foursquare has about 4 million users, although it’s not clear how many of those are regular users of the service. And Facebook has just launched an add-on to Places for mobile: a service called Deals that allows retailers and other merchants to offer discounts to users who “check in” to a specific location. The social network has already signed up several major advertisers for the service, including The Gap (s gps), Starbucks (s sbux), American Eagle Outfitters (s aeo) and McDonald’s (s mcd). Since then, Foursquare has scaled remarkably, and despite my skepticism, I am not surprised and would not have been surprised a year ago. But I still believe that the privacy issue is a real one, and that it has manifested itself in the selectivity users employ in checking in to certain places and not others. Will incentivization via deals and specials change behavior? We’ll see. One way or another, I still suspect that LBS services in their current (or near future) form will remain relatively niche activities. And that’s OK. The userbase will be passionate, brands/local merchants will be able to reach new customers, and Foursquare will make a pretty penny connecting the two. Location isn’t just about your current location. I have both Foursquare and Gowalla on my phone, and only ever use them to see what might be of interest around me. They don’t do the best job of that either, because both are chasing the checkin game elements. There is no question that location based services (LBS) is an emerging market. You are seeing evidence of this being peppered around retail shops across the country. One of the best use cases of LBS is Starbucks. They are working with Foursquare to reward you with discounts and badges. They have also taken it one step further and introduced a contactless payment system. This is a massive step forward for LBS â€” you tie that into game mechanics and youâ€™re cooking. Letâ€™s not forget that â€œcheck-insâ€ are only part of the equation. The social networks and retailers need to indoctrinate that social consumer. This is a shopper that tweets,, retweets, Likes, uses QR codes, uses AR, etc. LBS is not a silo itâ€™s an ecosystem of networks, services, applications and relationships. So will Places kill Foursquare? I really donâ€™t know. Places has failed to impress so far. Foursquare is doing a nice job â€” 4 million active users and retail shops like the Gap and Starbucks are getting comfortable using Foursquare. Currently, I use a platform called Geotoko (http://geotoko.com) that lets me run/manage foursquare promotions. They give me analytics that foursquare can’t provide and lets me manage all our 25 locations at once. If they add in facebook deals, then that would be my go-to platform to manage location-based deals. Right now we’re just experimenting, but just in the past 4 months, we’ve found that by adding an incentive to check-in, tweets related to our properties have increased and our social presence has helped our rankings on google. It may take another year for it to catch-on and reach the tipping point… but mobile and location is here to stay. Thanks for that, Rainn — appreciate you giving us some examples of your experience. In perspective, 4% of total is nearly 12% of smartphone users. Add Googles new /Tags feature to maps (paid advertising on maps) for low cost, easy to manage campaigns and we will see a 2x or 3x increase in LBS over the next 6 months (I’ll put money on it). If it hits 1/3 of all smart phone users, well, that’s a lot better than the Ratings a Prime Time television show gets. I would say that /Deals and /Tags are aiming at the low-hanging mobile marketing fruit. Quick deals and mCoupons. What they are going to knock out are the current SMS services that offer similar dumbed-down mobile engagement. If you can’t afford a smart phone, I don’t think Retailers care about you, so, they’ll dump SMS in a heartbeat and glom onto these cheap/quick LBS services. More complex campaigns and truly interesting mobile marketing engagement will be offered by high end companies. I do agree though, checking in for the sake of checking in seems to be wearing out it’s welcome. There needs to be something else in the backend to “quid pro quo” the desire to interact. At http://www.livechatconcepts.com/ we “check in” users when they interact with one of our sites eg http://www.livefootballchat.com/ or http://www.livebasketballchat.com/ etc but at the end of the day checking in and posting a note out to your twitter and facebook accounts saying you just logged in secondary;The primary purpose is being on the site to chat live while watching the game. There is much discussion about location based apps not unlike four years ago when people would say “What’s a tweet?” and fifteen years ago when a buddy met his wife (of now 11 years) on the Internet. That’s progress, that’s change. Close to two billion humans have Internet access which is about a quarter of the planet’s population and about a quarter of that has a Facebook profile and who really knows how many heavy users are on the channel. According to Zuckerberg, FB is where we should live and they’ll even sell us a smartphone while we’re at it. Foursquare, Gowalla, Places and a bunch more being developed as we type in basements far and wide will continue to try and tap into human behavior. I think location-based services will definitely go mainstream. From a marketing perspective, the goal of brands has always been to communicate with the consumer. For 60 years, marketers have helped brands do this by communicating with consumers when they know that they can – while watching T.V., listening to the radio, driving down the highway, checking the mail… Basically, and this is obvious, the marketer always attempts to reach the consumer when the consumer is practically available. If there are enough entertaining reasons for the consumer to utilize location services, there will be marketers all over it. Couple this with great incentives, deals and offers, and location services will be mainstream in no time. This combination of entertainment value for the consumer and a forum for the marketer is what has and will propel mediums for many, many years to come. There were about 150 other things over the same time period that never went mainstream, very misleading comment. I don’t know why this is what comes to mind, but who remembers mini discs and laser discs? One important distinction that the NY Times and this article don’t make is the difference between Location Based Services (LBS) versus Check-In Apps & Location Sharing Apps. Google Maps is a Location Based Service. Urban Spoon is a Location Based Service as well. I think the premise of the NYT article was specific to location sharing and check-in services and NOT LBS as a whole. If you look at the data for LBS on the whole, user adoption is FAR higher (for example, recent data shows that 63% of iPhone users utilize LBS on a WEEKLY basis). Let’s please be careful about not lumping all of LBS into the check-in catagory just because Foursquare or Facebook Places happens to be the topic du jour. Can you point me to the source of that data that shows 63 percent of iPhone users make use of LBS? I’m also not sure that LBS will ever go mainstream and as a marketer I’m not sure it needs to. At my company we’re utilizing the location mavens to build awareness for our clients; piggybacking on their natural inclination to share their location AND their opinion about products/services. Thanks, Michael — you are right that it doesn’t necessarily need to be mainstream to be useful for many, both users and companies.